Some transformers have a <Rejected> output port. This port outputs features that do not meet certain criteria to be processed properly by the transformer. For example, the ShortestPathFinder transformer computes the shortest path in a network that contains a series of lines. This transformer can only process linear features. Therefore, other features that are input, such as polygons, are output through the <Rejected> port. 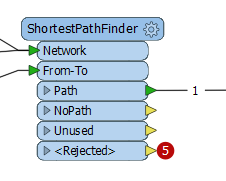 When feature count display is enabled, you can see the number of features that are output through the <Rejected> port after a workspace is run, and view those features in FME Data Inspector. To view the rejected features in FME Data Inspector, double-click on the feature count number, or right-click and select Inspect.